Genuine 6.5-7mm round Freshwater Cultured Pearls* with larger Our Fathers enclosed by ornate handmade Bali Sterling Silver caps, with Fresh Water "button" Pearl accents. These are Pearls of exceptional quality - very uniform in size, shape, color and luster with no rings, wrinkles or bumps. The 2 1/4" Deluxe Streamer crucifix and 7/8" Wreath Framed Miraculous center are satin finished sterling silver, with engraved highlights. All wire, chain and findings are also Sterling Silver. Pearls are a recognized birthstone for June and an appropriate gift for any woman. Deluxe crucifix/center sets on #1, #2, #4, and #5 are all interchangeable at the same price. *Cultured Pearls, both Freshwater and Saltwater, are Real Pearls. They are grown under controled conditions inside of oysters and freshwater molusks. which causes a pearl to grow around it. Swarovski and Glass pearls are not real pearls, they are immitations made with a pearlized coating. Swarovski Crystal pearls are made by a process that makes them much more resistant to peeling than other types of glass immitation pearls. Genuine 7-7.5mm round Freshwater Cultured Pearls*, with larger Our Fathers enclosed by ornate handmade Bali Sterling Silver caps, with Fresh Water "button" Pearl accents. These Pearls are very uniform in size, shape, color and luster with no rings, wrinkles or bumps. The 2 1/8" Deluxe Roses crucifix and 1" Rose Wreath Miraculous center are satin finished sterling silver, with engraved highlights. All wire, chain and findings are also Sterling Silver. 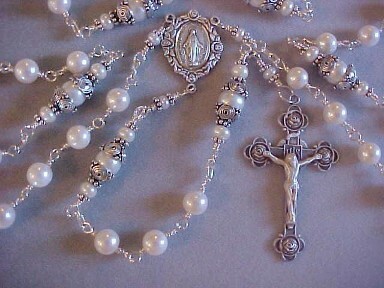 This rosary is truly magnificent! Pearls are a recognized birthstone for June and an appropriate gift for any woman. Deluxe crucifix/center sets on #1, #2, #4, and #5 are all interchangeable at the same price. * White with creme rose overtone is a natural color and is the most desireable to most women. ** White pearls are lightly bleached by a process that is not harmful to the pearls. Available in 7 different gemstones! 6mm & 8mm Rose Quartz capped in hand made Sterling Silver and Freshwater "button" pearls. 1 7/8" Lily Crucifix and 3/4" Miraculous Medal Escutchen center are satin finished sterling silver, with engraved highlights. All wire, chain and findings are also Sterling Silver. Rose Quartz is a recognized birthstone for October and the stone of romance. 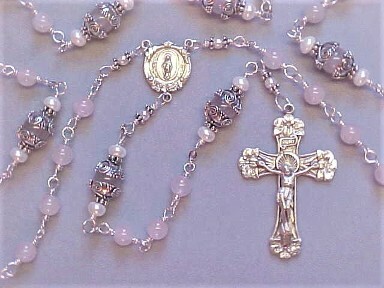 NOTE: The Rosary Center shown has been discontinued by the manufacturer. It is replaced by the Draped Miraculous Medal Center shown on Rosary #12. This style rosary may also be made with 6 & 8mm Angel Stone (powder blue), Honey Jade (butterscotch yellow) Purple Amethyst, Celery Jade (pale green), Peridot Jade (lemon-lime), or Lapis Lazuli (Navy blue) Please inquire. 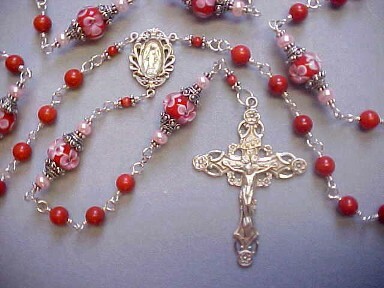 There are no Bronze or Pewter components the same design as the crucifix and center shown, but this rosary could be made with a different style crucifix and center. 7 or 8mm A grade faceted genuine Rock Crystal Quartz is not leaded glass like other types of crystal but natural flawless clear Quartz which has been gem cut. 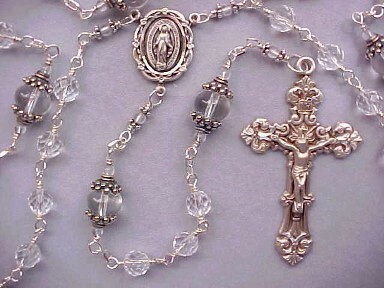 10x8mm smooth Rock Crystal rondelles are capped with hand made Bali Silver This Rosary has a very smooth feel and quiet handling unlike tin cut leaded crystal. The 2 1/4" Deluxe Filigree Crucifix and 1" Floral Lace Edge Miraculous Medal center are satin finished sterling silver with engraved highlights. All wire, chain and findings are also Sterling Silver. Crystal is a recognized birthstone for April. Deluxe crucifix/center sets on #1, #2, #4, and #5 are all interchangeable at the same price. Also availabe with Chinese Crystal with traditional loop construction in Pewter for $57. Pewter crucifix is smaller. A smaller version of this rosary is available in Sterling Silver with 5 or 6mm faceted Rock Crystal Quartz and 7 or 8mm round smooth clear Quartz Our Fathers, with the parts shown on #16 on Designer page 4. Please inquire for prices. 7mm Red Coral (*see note below) combine with 9x12mm red lampworked glass with pink flowers sealed under clear glass, capped in Bali Silver with smaller Red Coral and Pink Freshwater Pearl accents. 2 3/8" Deluxe Floral Crucifix and 1" Ribbon Edge Miraculous Center (Note: this crucifix and center were discontinued and are replaced by the set shown on rosary #37, Designer Collection 8) are satin finished sterling silver, with engraved highlights. All wire and findings are also Sterling Silver. 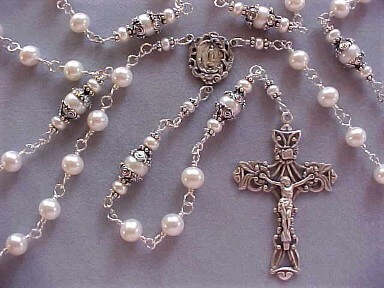 A truly beautiful rosary! NOTE: There are over 2,000 varieties of Coral around the world. It is formed by the Calcium Carbonate secretions of small sea creatures called sea polyps, some of which are free swimming and some of which are anchored to other material in the Coral Reefs. This Coral from the Pacific Coral Reefs is naturally grayish white. It is usually bleached and then dyed pale pink to vivid crimson red, giving it the same appearance as more expensive Italian Coral, which is naturally colored from the Mediterranian Sea. The Italian Corals rarely grow bigger than 3-4mm, which is why it is rare to find larger size beads of Italian Coral.